IHH Humanitarian Relief Foundation, that is continuing aid operations in Yemen where the humanitarian crisis has reached life-threatening levels, is continuing to deliver the aid support from our donors to the aggrieved and needy. In this scope, IHH distributed a thousand tanks of drinking water. 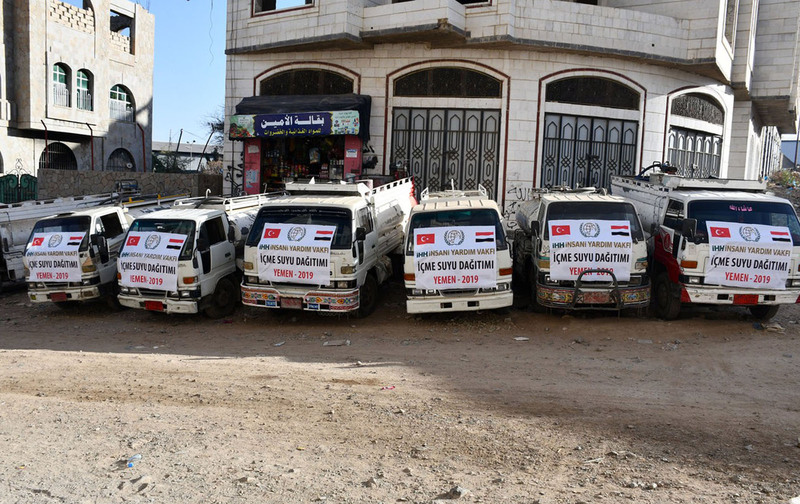 As a part of the distribution in the Taiz and Marib, a month supply of water was delivered to thousands of families that are experiencing great difficulty in finding water due to the domestic war and drought. Aid consisting of a thousand tanks totaling 4 million liters of water was distributed as clean water is vitally important to prevent diseases in regions of war where there are widespread epidemics. With the arrival of hot weather, the water shortage has increased. There is a request of drinking water aid from Yemeni families, particularly those living in Taiz. There is concern that if aid is not delivered immediately deaths will be inevitable due to drought. Donors that want to give aid to the Yemeni people who are struggling with the domestic war and drought can donate 5TL by texting YEMEN via SMS to 3072 from all network operators. Those who wish to donate higher amounts, our donors can contribute via IHH bank accounts stating PROJE KODU 10468 in the explanation section.